The roots of your teeth are what hold them in place and if dental decay spreads to the inside of your tooth, where the root is, then the nerves and blood vessels can become infected. When this happens, there is a serious risk the tooth can be lost. Endodontics is the study of the root system within your teeth and the most common endodontic surgery patients require is the root canal. A root canal is a rather simple surgery that can save a damaged tooth from being extracted. When the root of a tooth becomes infected it can cause you a lot of pain and can destroy the tooth. During a root canal procedure, a dentist will enter the tooth, remove the infected pulp and then fill and seal the space left behind. Often a crown will be recommended if there is significant decay. Don't let their scary reputation put you off. 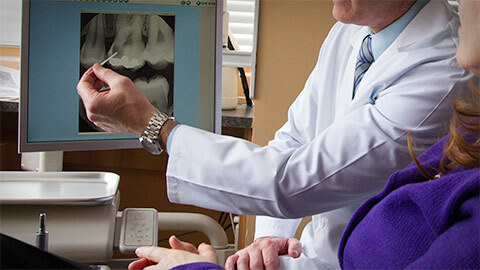 Root canals are virtually painless and extremely important in saving a tooth. If you are suffering from tooth pain, call us today - our friendly staff would be happy to book an appointment for you.